Real Madrid host Juventus at the Santiago Bernabéu on Wednesday in the second leg of their UEFA Champions League quarter final clash. The spanish giant lead 3-0 from the first leg. 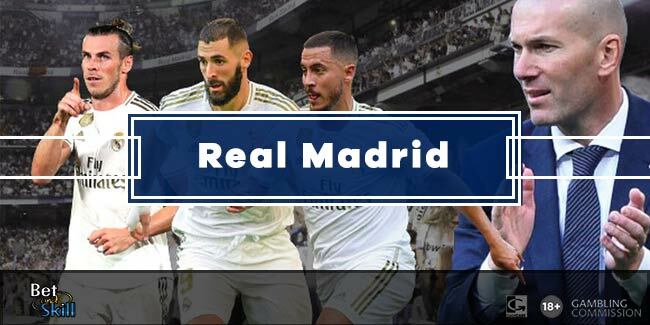 Check out here our Real Madrid vs Juve betting preview with predictions, free tips, starting lineups, team news, best odds, exclusive offers and no deposit free bets to use on football betting! Real Madrid enter the return match on the back of a 1-1 draw in the Madrid Derby with Atletico, a game in which Zinedine Zidane rested several of his regular players. In their last six games at the Bernabeu, Real have scored a staggering 22 goals. Conversely, they have also conceded eight. The Blancos have found their top form too late to challenge Barcelona for La Liga title as they sit 4th in the table, 15 points from the summit. Zinedine Zidane's side has kept just six clean sheets in 23 home games this season. The Galacticos have conceded in eight of their last ten home matches but they have not lost a Champions League home match since March 2015. Sergio Ramos is suspended for the hosts while Nacho and Jesús Vallejo are also injury doubts. As a result, Casemiro could partner Raphael Varane as centre back, with Mateo Kovacic replacing the Brazilian in the middle of the park. Dani Carvajal and Marcelo will retain their starting berth as full backs, as well as Toni Kroos and Luka Modric in midfield. Up front, Isco will retunr to the starting XI, supporting the attacking duo formed by Cristiano Ronaldo and Karim Benzema. The likes of Marcos Asensio and Gareth Bale are the offensive alternatives. Juventus have warmed up this weekend with a 4-2 away victory at rock bottom side Benevento. The Bianconeri still boast a 4 point lead at the top of the Serie A standings. Domestically, the Old Lady have won 13 of a possible 16 games away from the Allianz Stadium and have lost only one. Max Allegri's men currently hold an 18-match unbeaten streak in Serie A. They have also shown they can beat European giants away from home in Champions League - we all remember how they knocked out Tottenham by winning 2-1 at Wembley. Anyway, no team has ever overturned a 3-0 home defeat in the Champions League. The visitors will miss the services of Paulo Dybala after he was sent off in the first leg, while Rodrigo Bentancur is also suspended due to an accumulation of bookings. Mario Mandzukic and Gonzalo Higuain appear sure starters up front, while Juan Cuadrado and Douglas Costa are in contention for the remaining sport in attack, as winger Federico Bernardeschi remains out indefinitely with a knee injury. Miralem Pjanic and Medhi Benatia return for the Italian champions, who sorely missed the duo in the first leg. The former will start as playmaker in midfield, wit Blaise Matuidi and Sami Khedira on his flanks. The latter will form the four man backline with Giorgio Chiellini, Mattia De Sciglio and Alex Sandro. Get 25/1 Real Madrid to qualify vs Juventus with Betfair (first leg ended 3-0)! New Customers can get Real Madrid at an enhanced 25/1 to qualify vs Juventus. Max Stake £1. Winnings paid in free bets, valid for 7 days, only deposits with cards/Paypal count. Exchange and multiple bets excluded. T&C’s Apply. 18+|Gamble Aware. Here at BetAndSkill we always provide our readers with best odds available on all the football matches we preview! You don't need to research the best odds on the Real Madrid vs Juventus match winner market (90 minutes only) because we have compared odds from more than 70 top online betting sites! Plus, we have a special sections where you can see all today's bookmakers price boosts! Find here the best betting tips on Real Madrid - Juventus, selected by our expert tipsters. You can back them on singles or combine them by requesting a price on bookmakers offering the Request a Bet feature! Plus, you can use the cash-out to pocket your profits in-play! Find here all the recommended cash-out betting sites! At BetAndSkill you'll find much more than football match previews! For instance, we also have special sections for daily BTTS tips, betting strategies and accumulator tips for the weekend! Get 25/1 Real Madrid to qualify for the Champions League semifinals with Paddy Power! They beat Juventus 0-3 in the first leg! Customers can get Real Madrid at an enhanced 25/1 to qualify vs Juventus. Max Stake £1. Winnings paid in free bets, valid for 7 days, only deposits with cards/Paypal count. Exchange and multiple bets excluded. T&C’s Apply. 18+|Gamble Aware. "Real Madrid vs Juventus 2nd leg predictions, betting tips, lineups and odds (Champions League - 11.4.2018)"